Professional Bull Riders (PBR) and Rare Labs, a leading software development firm, game developer and producer, today announced the release of 8 to Glory, a new mobile game for fans of the fast-growing sport of professional bull riding. 8 to Glory, which is available now for iOS and Android devices as a free download, features more than 30 of the top PBR athletes as well as dozens of leading PBR bulls, including Jared Allen's Air Time and Magic Train. Allen, a former NFL star who owns some of the rankest bulls competing in the PBR, came up with the concept for the game, and is the driving force behind 8 to Glory. 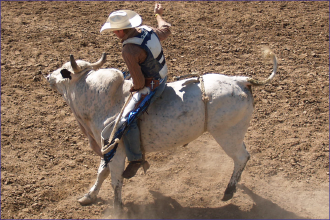 He will help market and promote the game as one of professional bull riding's most ardent supporters. Gamers can play individually or compete against fans around the world. Additionally, they can ride random bulls or purchase digital card packs which unlock the ability to play different riders and bulls as well as booster packs offering upgrades for the riders in their toughest match-ups. "We've worked closely with Jared Allen and the team at Rare Labs to create a realistic mobile game featuring our top bull riders and bulls, which allows fans to compete throughout the PBR season," said PBR CEO Sean Gleason. "8 to Glory is a fun way for PBR fans to connect with our athletes and the sport while competing for bragging rights as the best cyber cowboy." "8 to Glory is a phenomenal way for professional bull riding to expand its borders," said Jared Allen, founder and head of Jared Allen's Pro Bull Team. "The game gives PBR fans an interactive way to be more connected. It's also a cool way to get the younger generation educated and involved in the sport." Following the initial launch, PBR plans to tie game usage to its PBR Rewards program, offering discounts on tickets and merchandise as well as other offers. 8 to Glory, the official bull riding game of the PBR, features more than 30 top riders including Kaique Pacheco, Jess Lockwood, Derek Kolbaba, Ryan Dirteater, Tanner Byrne, Fabiano Vieira, Joao Ricardo Vieira, Mike Lee, and more. Additional riders including J. B. Mauney, Cooper Davis, and Silvano Alves will be added to future game releases. The game includes more than 30 rank bulls to master, including Bushwacker, coming out of retirement, along with Air Time, Asteroid, Bruiser, Long John, After Party, Magic Train, and other top bovine athletes.